Chronic inflammation - means that it will remain permanent and cannot be cured but can be treated. The reasons are numerous and often very different. Generally speaking, we are talking about the symptoms of wear of joints. Firstly, the articular cartilage is affected by the disease. All the structures affecting the structure and function of the joint, synovial fluid and the inner joint synovium, as well as the external articular capsule surrounding the joint, ligament and then muscles are gradually absorbed to complicity. Basically, any joint can be exposed. However, particularly vulnerable are joints that bear the greatest burden, such as knee joints, when we talk about gonathrosis, hip joints (coxarthrosis), spine and lumbar vertebrae (spondyloarthrosis), less in the joints of the fingers (risarthrosis). This disease also appears in the form of inflammation of the cervical vertebrae, shoulder joint, elbow and ankle and finger joints. First, there is damage to the articular cartilage and release of chemicals which make this health defect exacerbate. Gradually, cracks occur in the cartilage, the cartilage is becoming thinner and water is getting out from it, which deteriorates its flexibility. Osteophytes are joint gnarls and later bone gnarls that grow particularly inside the joint, very close to the attachment of the joint capsule. These tumors induce bigger pressure on the articular capsule, so that the pain is increasing more and more. This leads to changes in the quality of the bones adjacent to the articular surfaces, particularly in relation to the deterioration of the flexibility. Because advanced rheumatic osteoarthrosis is associated with large pain exceeding to unbearable pain, a sick person tries to move as little as possible. However, this results in even smaller production of synovial fluid, the cartilage is even less supplied with the necessary nutrients, the muscle mass shrinks, the joint over time becomes more and more rigid and the person becomes less and less mobile. Lack of mobility in connection with the disease is associated with a huge decrease in the quality of life and independence, especially for the elderly. Run, dance, walk, catch- every day we repeatedly move. This is only possible through the connections between the bones (joints). Joints are connections between the bones allowing to perform physical movement. From the outside, the joints are surrounded by a joint capsule. Using tendons and ligaments, the joints are integrated with the motoric system. Inside the joints, there are bone heads covered with a flexible joint cartilage having a thickness of 3 to 5 mm. Cartilage serves as protection of the bones laying between it - the cartilage softens hard connections and compensates sudden movements. A healthy cartilage distributes the load on the surfaces of joints, inhibits and relaxes. It consists of a paracellular matrix of the cartilage (between the cells of the substance), to which a three-dimensional lattice of collagen fiber is inserted. Between this, there are chondrocytes producing protein for fibers providing glue (collagen - protein warp) and building blocks of the basic substance. The ground substance called a matrix is composed of very large molecules called proteoglycans (a combination of carbohydrates and protein), which have the ability to bind a lot of water on themselves and in this way they can take care of flexibility and shock absorption. In addition, the matrix comprises glycosaminoglycan, which includes, inter alia, hyaluronic acid and chondroitin sulfate contained in the synovial fluid. 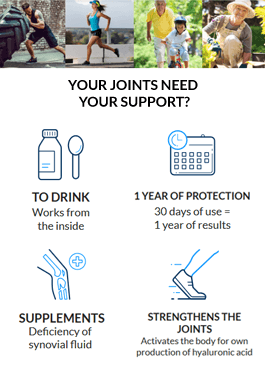 Did you know that by supplementing the low level of synovial fluid you positively influence the elimination of inflammatory processes in joints? 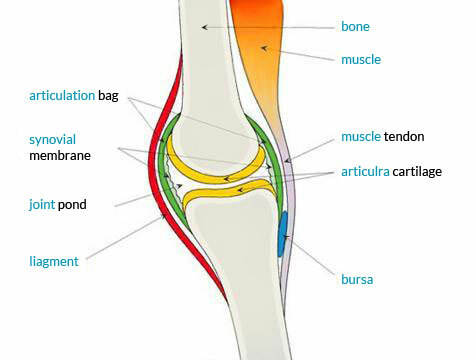 The articular - ligamentous capsule is filled with a substance called synovium inside. The synovium nourishes the cartilage with nutrients and produces synovial fluid. Synovial fluid is a colorless, viscous liquid partly consisting of blood and mostly of hyaluronic acid, which is much more than just 'synovial fluid'. Hyaluronic acid gives it high viscosity, which in turn improves the sliding ability. A healthy joint 'lubricates itself'. when there is burden, the liquid is squeezed out again. Most of it where the burden is the greatest. In this case, the liquid is separated from each portion of the joint and a sliding coating is formed. Through this 'smearing', the joint has five times greater sliding capacity than ice. 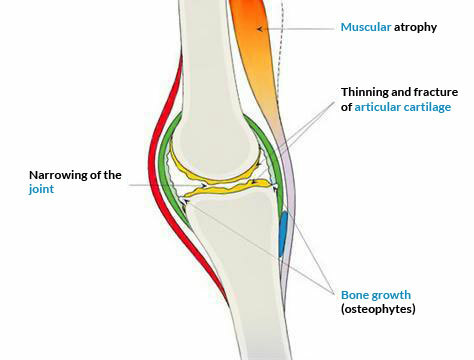 Load changes and the release of the joint are the basis for supplying the cartilage with nutrients. During movement, there is a change in pressure within the joint which results in the nutrition of the articular cartilage. The exchange of nutrients is only possible during movement - that's why it is so important. On the basis of the progressive degeneration of the cartilage layer, the body tries to break down remains of cells and tissue, which in turn allows for the release of the proteins. These released substances are pressing on the already damaged cartilage, which causes an inflammatory response in the joint. Through inflammatory processes occurring in the joint, pain at rest arises, so-called stiffness in the case of remaining in one position, in which we usually do not remain longer than 30 minutes. We are talking about activated arthrosis. If the joint is not sufficiently lubricated and articular cartilage is already heavily degraded, bone surfaces rub against each other. This process causes pain until a sufficient amount of synovial fluid will not be delivered to the joint with the next move. A man afflicted with this disease has problems with walking out of bed, but after some time he 'diverges' the pain. ALMOST HALF OF ALL PEOPLE OVER 50 YEARS OF AGE LIVING IN INDUSTRIALIZED COUNTRIES HAS JOINTS AFFECTED WITH ARTICULAR DEGENERATION. In the past, arthritis was seen as a disease of the elderly. Today we know that this disease is not only due to age. In truth, aging has an effect on the formation of arthritis, but a young man may also suffer. In addition, psychological burdens, stress and depression can lead to changes in the quality of synovial fluid. The main risk factor is particularly excess weight, when there is huge overload of the joint, and then above all, lack of exercise, it can cause failure of metabolism in joints, which in turn will contribute to the development of arthritis. To avoid and prevent all possible factors threatening the occurrence of this disease, it is critically important to ensure proper care and necessary nourishment. When you feel pain around the joints, first go to a specialist. Proper diagnosis is the basis of treatment. Another important issue that cannot be missed is MOVEMENT. First of all, let's rely on activity in relief, e.g. swimming on your back, stationary bike, yoga. It is also good to choose a right set of exercises for daily gymnastics.